I like to think that John Kenneth Galbraith was a bit on the cynical side. Still I’ve never been particularly fond of meetings (who is?). Despite trying to learn more about running effective meetings, I’ve lately been developing a list of pet peeves about meetings. There is nothing more annoying than listening to someone conduct a meeting within a meeting. 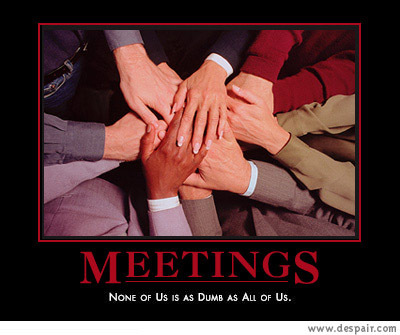 Honestly, meetings should, for the most part, cover higher level issues on a project, such as progress or difficulties. They are meant to keep everyone on the same page as far as progress goes. They are not a good time to bring up this niggling little issue that’s been giving a person problems but that person failed to ask their coworkers about until they’re sitting down across from them. And double curses on people who carry on despite people suggesting it would be better discussed after the meeting. Have you ever been sitting in a meeting where it seems to be a discussion between two or three people? And you’re wondering why you’re even there? They’re not even looking at you, so you wonder if it’s safe to take a nap. I’m glad you feel why x, y and z are critical issues for the project…but why? If you can’t explain it, how am I supposed to make the connection? I am constantly amazed how two people can walk out of a room with a completely different impression of what just went on. (Heck, this started in college…ever walked out of a class wondering what just happened while the prof thought everything was crystal clear?) Given how often I have experienced it, it still surprises me that people fail to realize it happens regularly and take steps to avoid it. It’s a good idea to spend five minutes making sure everyone knows where things are going. It’s always lovely when someone decides to lambast everyone else because obviously their role in a project is superior. What’s even worse is the person who will tell you that the project isn’t a big deal, so why putting in too much effort? So what do you find most annoying about meetings? I think the worst aspect is when people don’t contribute because they’re too afraid to speak up. It’s one thing to fail to talk to everyone, but when someone doesn’t engage or is too afraid to share their opinion (which might be contradictory), it’s a waste. Then there’s no point to having a meeting. Yeah the “why am I here?” is bane of my meeting existence. I also enjoy when someone else gleefully tells me someone else’s meeting is a complete waste of time, but then proceeds to hold their own incredibly long and overpopulated meetings that are of equal waste of time.